Hi. My name is Scott Schilmoeller. I am from St. Gerald's parish in Omaha, NE. I have spent most of my life in the Omaha metropolitan area. I attended grade school at St. Gerald's grade school and middle school at St. Joan of Arc. My high school years were spent at Daniel J. Gross Catholic High School. After graduating from high school in 2006, I attended two years of college at the University of Nebraska-Lincoln and two years at the University of Nebraska-Omaha. While attending the University of Nebraska-Lincoln I became acquainted with the group FOCUS (The Fellowship of Catholic University Students). Not only did I find that people my own age practiced their faith, I soon began to take my faith life seriously as well. I joined a bible study and went on some mission trips. I found the true joy that I was looking for and I couldn't get enough. My senior year of college I lead a bible study and a few mission trips. I discovered that my true passion in life is loving Christ and bringing his love and joy to others. After much prayer and discernment I decided to apply to the Seminary. After being accepted I had a chance to meet all the seminarians for the Archdiocese. There is an amazing sense of brotherhood and fraternity among the seminarians. 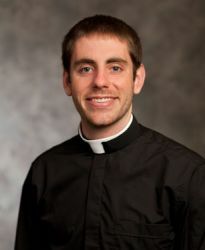 I am just beginning my years as a seminarian. I pray that I will be able to follow God's will throughout my life. Some hobbies of mine include playing basketball, running and swimming. For anyone who is thinking about joining the priesthood, know that God has a plan for you. He doesn't want you to be unhappy or afraid. Following God is the most fulfilling thing you can do in life.